Prime Minister Shinzo Abe is pursuing structural economic reforms in Japan. Voters handed the architects of Japan's bold new economic policy a sweeping electoral victory over the weekend, delivering 76 of the 121 open parliamentary seats to the Liberal Democratic Party and its coalition partner. The result should boost the so-called Abenomics platform championed by Prime Minister Shinzo Abe -- a mix of coordinated government spending, central bank stimulus and structural economic reforms designed to push up prices and end 15 years of deflation. The fiscal and monetary aspects of the program have already helped weaken the yen and dramatically boost the profits of exporters, driving the Nikkei index through the roof in the process. But one pillar of the Abenomics strategy -- structural reforms -- has been delayed by political barriers and the LDP's relative lack of power in the upper house. The proposed reforms include efforts to make labor markets more flexible, encourage immigration and draw more Japanese women into the workforce. Now that Abe's coalition controls 133 votes in the 242-member upper chamber, analysts said that the reforms stand a greater chance of approval. "It's done. Abe is in full control now," HSBC economist Frederic Neumann wrote in a research note. "Yet his real test still lies ahead. He must urgently implement far-reaching reforms to make his economic revival stick." Abe has promised to do just that -- saying that his government will now move ahead "with speed." Exit polls indicated that the vast majority of voters support Abe's economic polices. "The economy is improving due to our brand of forward thinking politics," Abe boasted. "Employment and wages will rise as the situation improves. Consumption will then rise and companies can invest the money they make," he said. "We want to create this cycle as soon as possible so that people can feel the effects." Yet results are not a foregone conclusion. While Japan's economy surged in the first quarter of 2013, growing a faster-than-expected 3.5%, a stock-market skid has raised questions about whether policymakers can pull off the high-wire act in the heavily indebted country. Some in Japan remain opposed to Abe's structural reforms, and the LDP fell short of number of votes needed to wield a majority without help from coalition partner New Komeito. 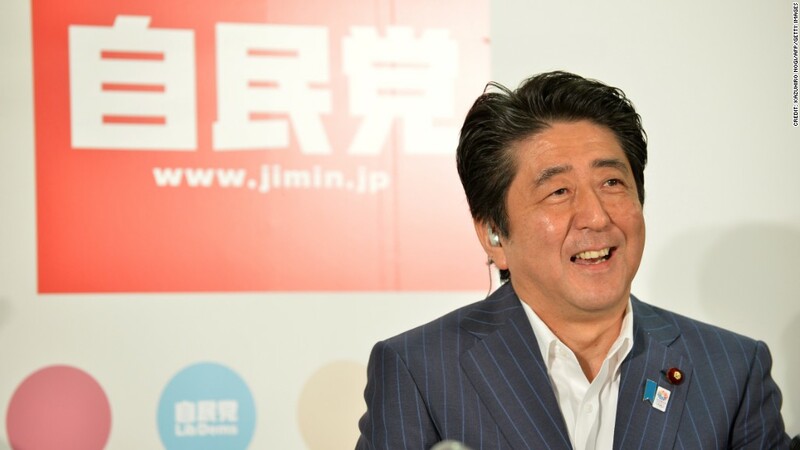 Economists at Capital Economics cautioned that the road ahead could be bumpy for Abe; New Komeito may not agree to all LDP plans, especially if the government makes an attempt to ramp up military spending. "The politicians could be forgiven for putting off difficult decisions until after the elections," the economists said. "But hard choices will have to be made soon to maintain the markets' confidence in 'Abenomics.' "